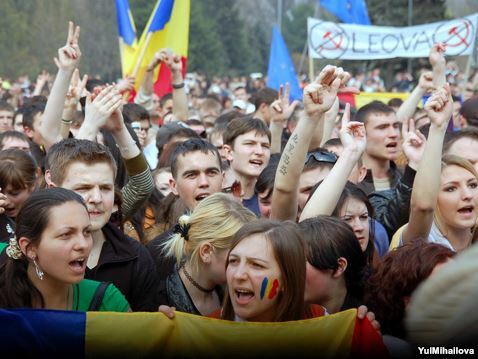 In early April 2009 Moldova witnessed a rare outburst of civic engagement. Thousands of young people took to the streets hoping to make a difference. Yet, the only tangible change they achieved was a renovated parliament, because the other vandalized building – presidential office – is still under reconstruction. The true irony is that politicians who sailed this protest wave and still occupy these buildings today have not learned from the April 2009 events. Parties that embodied change at the time turned out to be a major disappointment. Many naively thought that these parties and the teams behind them would be different from communist cronies, but six years after we can sadly conclude that, in comparison, communists were not that bad after all. Even the party that trademarked the phrase “Moldova without Voronin, Moldova without Communists” is now in a tacit coalition with the reds. It does not get more hypocritical than that. Meanwhile, the younger generation, which brought these seemingly pro-European parties into power, suddenly became disposable. It is truly shocking to see that parties that owe their power to the youth have failed to implement any policies that would create new opportunities for those young people who have not yet decided to emigrate. Instead, the ‘new wave’ politicians have used the same old tricks of manipulating the electorate through control of media instead of building a genuine alternative to the past. Sadly, parties that came into power on a flux of civic activism quickly became immune to civil society’s criticism. To be fair, leading figures from many prominent NGOs and think tanks have been co-opted into power, thus increasing the level of self-censorship among the said institutions. Thus, a seemingly positive trend of civil society engagement turned out to have largely negative outcomes, given that some of those NGO figures have already been pushed out of politics amid scandals. Once prominent voices in the public arena were made scapegoats for backroom deals they had nothing to do with (Banking sector shenanigans, murky airport lease etc.). Today, any reputable public figure should think twice before joining the current political establishment. The most disheartening outcome of April 2009 protest is by far the complete and utter discrediting of the Pro-European Reform Agenda. All these six years, the ruling parties have drawn most of their public legitimacy from the promise of European Integration. After a short honeymoon, it became apparent that Moldova was drifting away from the very European values local politicians like so much to preach about. Yet, when you repeatedly fail to practice what you preach, your flock will eventually start to lose faith. In the case of Moldovan voters, there was little faith to begin with. After six years of paying lip service to democracy and rule of law, support for European integration is in the low 40s, from high 70s in 2008. Even the all forgiving European officials are now shaking their heads in disbelief when looking at the sheer impudence displayed by Chisinau political minions. Alas, needs must when the devil drives! Note: The wittingly labeled “Twitter Revolution” has almost nothing to do with Twitter per say. Ironically, it was mostly Russian social media sites that served as a vehicle for crowd mobilization, along with cell phone text messages. According to some accounts, there were just a few hundred Twitter users in Moldova at that time.